Oh yes, those old school veterans who have been around since 1991 and played more than five times at OEF's Battlefieled in Trutnov will hit Japan to play at OEF Asia this year. Be prepared for a heavy rock´n´roll demolition. For a music that will rip your denim and leather!!! BANZAI!!! MALIGNANT TUMOUR and OBSCENE EXTREME…this is an indivisible bond that started more than 20 years ago and still exists. That is why and also thanx to their highly valued split release with SQUASH BOWELS celebrating 20th anniversary of the release in 1997 at OBSCENE PRODUCTION this year we can announce their special and exclusive (one and only) concert set at Sunday´s OEF afterparty show. As some of you might guess, this entire set will be dedicated to the „old“ Malignant´s years from 1994 till 1997 with most of the songs being from the aforementioned split. This concert will also be presented by the line up of that time when Bilos was on guitar and the throat, Otto (NEEDFUL THINGS, LYCANTROPHY) on bass and Michal (ex CEREBRAL TURBULENCY, RUBUFASO MUKUFO) on drums. As a bonus to this show a remastered split album of MALIGNANT TUMOUR/SQUASH BOWELS will be released in a vinyl version!!! Pathological grindcore as it used to begin here in the Czechia!!! Are you looking forward to see this??? We are!!! Bilos : "In fact, having listened to the voices of the fans for a long time I decided to give it a go as many of them asked me if they ever could see MALIGNANT TUMOUR in a grindcore shape once again and the anniversary of the split with SQUASH BOWELS helped it a lot, of course. I called the ex members, because there is no way to play that set with anyone else and they both said yes. 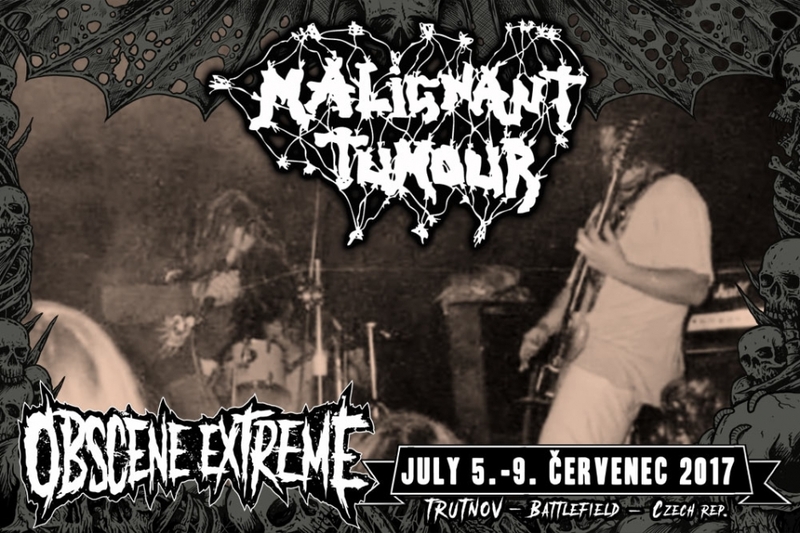 And where else to play than at OBSCENE EXTREME festival??? I guess there is no better place!!! It will really be only a single show so if you are interested to see and hear it you will have to to stay at OEF till Sunday's afterparty!!! I am really looking forward to that!!!"